All transactions are safe and secure with a reliable history in online purchasing behind each of our associates. 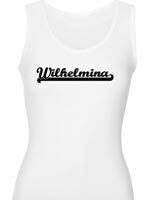 Buy the Wilhelmina t-shirt to own Ugly Betty clothing and merchandise. This Wilhelmina Ugly Betty t-shirt is the perfect piece of merchandise to wear when showing off your vicious side. Wilhelmina Slater (Vanessa L. Williams) is the cruel magazine editor at Mode who despises Betty Suarez, and who is constantly trying to undermine the magazine's editor-in-chief, Daniel Meade (Eric Mabius). Daniel is Betty's boss. This Wilhelmina t-shirt is a tribute to the most ruthless employee at Mode Fashion Magazine, Wilhelmina Slater. Look for Wilhelmina Ugly Betty hats. In addition to the Wilhelmina tee above, browse the Ugly Betty Clothing Gallery for more apparel like men's and women's clothes, kids shirts or hoodies.